The Japanese go term aji keshi, which has been adopted into English, consists of the terms aji (possibility) and keshi (erase). 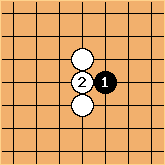 Aji keshi is a move that unnecessarily removes one's own good aji in the opponent's position and an important concept to understand. 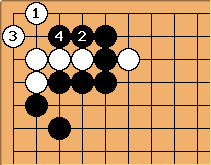 ...because Black has another possibility of playing a wedge and cut somehow, which may be more damaging to White depending on circumstances. Often seen aji-keshi in amateur games is an automatic atari like . He must defend at . If not for it, Black may consider a tenuki. Because even after White's cut, Black can threaten a throw-in at (White has a weakness at 'a') and escape to . The exchange of for in this diagram is a bad move. 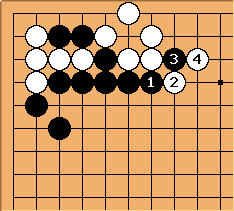 By playing this way, Black loses the chance later, when there might have appeared a black stone at a, to peep at , followed by White at , and Black b. This loss of potential is much more important than the one point of white territory that Black destroys. Charles Matthews I'd like to amplify this. You have first to imagine a follow-up play, such as . How did it get there? We can't be sure. It could for example be part of a complex fight spilling out from the top right corner. This is one sequence that can follow. It is clearly good for Black, locally speaking. This is another useful sequence for Black. In this case Black ends in sente. That could be an important difference, in heavy fighting. 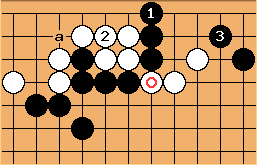 So there seems to be a reason for White to play , looking to get sente by giving up this stone. looks to connect Black up on the outside. is indicated, to prevent that connection. 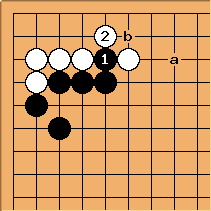 But this leaves Black two good options: Black a White b with sente; or Black b White a Black c White d Black e for a squeeze and outside influence. 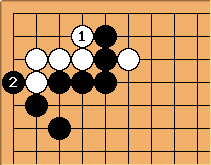 In summary, we have looked at just one black follow-up play round here - leading to at least two interesting variations from Black's perspective. The point I wish to make is that aji doesn't consist of a single sequence you wish to preserve as a future possibility. It is the whole complex of interesting things that might happen locally. unkx80: Then happily seals White inside. If captures, then Black gains sente. tapir: Black can later close the top side in sente. This is worse for White. Bill: Black can also play , nobi. unkx80: I moved the discussion to unkx80 / Go Terms Questions. Andy: I think the major point is you don't want to collect a small gain, even if it done in sente, if you can leave the situation unsettled and wait for and/or engineer the surrounding situation to turn the residual potential into a larger profit. 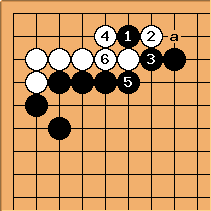 The initial small sente gain isn't going anywhere, so you can always play it later in the yose where it more properly belongs if nothing better winds up developing. Pashley Can't it also give an interesting ko threat? It seems to me (12 k?) that if 1 here is played as a ko threat and White ignores it, Black's next move causes grief. For all I know, some other attacking move is better, but 3 is the obvious move. 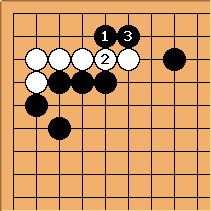 I think W dies in the corner after that, but this is the sort of situation where stronger players often surprise me. At best, W lives small, enclosed, and in gote. Ignoring the ko threat costs him something. Tapir: Yes it is a ko threat. But it is a losing ko threat. (You lose all the other potential moves around it. If you make too many losing ko threats even winning the ko may not be enough to gain the cumulated losses back.) It is however played when an early ko arises that White can't afford to lose while lacking ko threats. Pashley Are you saying there is a loss for Black here even though he kills the corner? Granted the exchange may be a loss overall if the ko is big enough, but it seems quite obvious to me (12k?) that it Black gets a large local profit if white ignores this threat. If I am wrong, I'd love to learn why. Pashley Thinking about it, I see that if White answers the threat, that's a loss for Black. We are then back to the original discussion of aji keshi. So you are saying this is a good threat only if W cannot afford to answer it. Willemien: the last one. It is a good threat only if White cannot afford to answer it. (and that is almost only the case in a game deciding ko) the ko threat is about 30 points (please correct the numbers if i am wrong) so if the ko is for more than 50 points and you have no other ko threats. Uberdude Willemien, I disagree, It can be a good threat even if white answers it (and a pro game database search confirms this). By "good threat" I mean the best move to play in particular game situation. 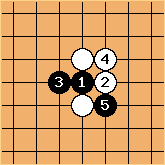 Of course it is aji keshi and thus incurs a local loss, so if you had other big threats available that incurred no loss (such as placements inside a group that threaten to kill it) of comparable size it would be better to play those instead, but it can be worth making such lossy ko threats for a big ko. 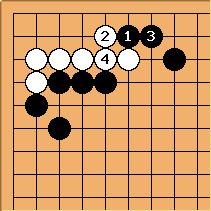 tapir: There is a page on ko threat amplification, which refers to this move as a forcing exchange before a huge early game ko, because the follow up threat afterwards is even bigger (and with limited threats in the opening, this often is enough). Also, who finally wins the ko and what ko threats your opponent has is important for evaluation. If you take a limited loss but thereby win a huge ko when your opponent doesn't get enough compensation that should be ok, but if you lose the ko anyway your loss making threat was no good. (One should count ko threats! Hard I know, because you have to calculate approx. move values for many moves.) Incidentally I played it yesterday as a ko threat. Pashley How many threats does Black actually have here? 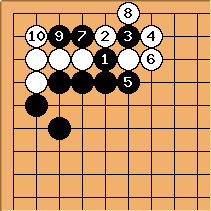 I'm not sure this is the best sequence, but it looks like all the White moves below are forced since without them the corner dies. I suspect there may be some way to get even more threats out of this, perhaps with a clever placement inside, but I cannot find it. I also want a way to get the threats without leaving W what look to me like excellent moves at a or b, but I cannot find that either. Stronger players, any comment? Bill: Part of the aji in aji keshi is ko threat potential. That should have been made clear. 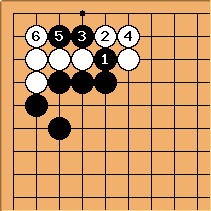 Uberdude: cuts on the wrong side, below is the way to play ko threats here (ko moves omitted) for black. 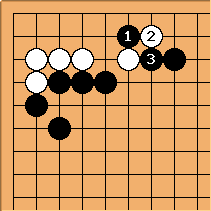 Note that he gets which is a useful move for the wall on the outside. 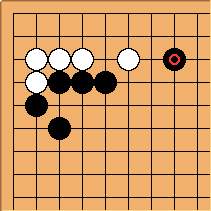 Note that instead of connecting at white can also consider capturing at directly to make black's next threat (atari at 6) smaller if white really wants to resolve the ko, but white is then pushed low. 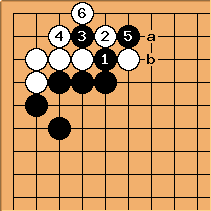 The threat at is another example of aji keshi: later black may well play at to keep building the wall. If black has played the threat white can safely hane and there is no cut due to the liberties from capturing . 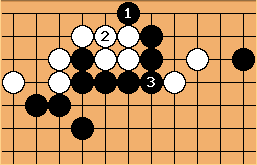 However, if black hasn't made the threat then black can cut and white can't immediately capture the stone, so particularly with a black stone for support down the side this cut could be powerful for black so white couldn't safely hane.